584 left in stock, Hurry! The Back Binding Rear Post is one of the areas the clip cord connects to the machine. You can attach the rear post vertically or horizontally to the frame, but you need to make sure the hole is pointing vertical so the clip cord can attach easily. 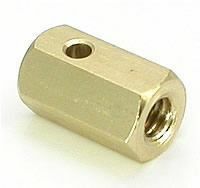 The Brass Back Binding Rear Post is M4 metric with a 4mm diameter of the threaded part and has a 0.7mm thread length, or the distance of each thread. It measures 12mm long and is made of brass.